Our aim is to provide top quality turf and topsoil with an efficient delivery service and to ensure our customers are completely satisfied with our service and product. We supply turf for golf courses nationally, in both large and small quantities. Summerhill Lawns Ltd is used by many well known companies and organisations, including Aras on Uachtaran, Botanic Gardens, Office of Public Works, many golf clubs throughout the country including the K-Club of Ryder cup fame, large and small building developers, GAA pitches, Landscapers, golf course construction companies and many Garden Centres. A purpose grown cultivated turf that contains the latest varieties of dwarf perennial ryegrass to give a really tough and hardwearing turf. It is widely used on tees, fairways, surrounds, pathways and sports pitches. The selected seed cultivars offer enhanced performance in all quality sports turf situations. Is available throughout the year and can be laid at any time except in frosty weather. Superior roll out appearance and easy to roll out. Where you need a turf to stand up to the demands of golf, a high percentage of ryegrass in the mixture is required. Summerhill Superior Rye Grade is a turf designed with this in mind. Please remember that turf is a mass of living plants and a certain amount of care and maintenance will be required to ensure it grows to its full potential. This premium blend is based on the well proven and highly recommended dwarf ryegrass variety Bargold. The hardwearing qualities of Bargold in a combination with fescue grasses will produce both a fine turf surface and stand up to wear and tear of traffic. Bar Plus is designed to produce a dense sward pattern and with the capabilities of standing up to a close mowing regime with a good resistance to disease. Summerhill Budget Turf is economically priced because it doesn’t meet our standard criteria for the above mixtures. The characteristics of Summerhill Budget Turf make it ideal for any projects that need a good value hardwearing turf. This grade of Turf might not be available all year round. Laying equipment will be given to contractor on loan for these size rolls. Summerhill Lawns topsoil product ensures you have a high quality soil to provide early establishment and development of turf, grass seed and all planting. The use of our topsoil is the foundation to a healthy landscaping project. Click on the icon for further details. There are many different grades of bark mulch available. Some are specialist and others are suited for a variety of applications. Summerhill Lawns Landscape Bark Mulch is a mid – dark brown, multipurpose grade bark derived from recycled green and woody plant material. Our Landscape Bark is a natural product and will greatly enhance the appearance of your landscaping project. Click on the icon for further details. Fine Bark Mulch from Summerhill Lawns is a premium grade mulch which provides the perfect finish and colour scheme for flowering beds and borders. Applying an 8-10mm layer of fine bark mulch will help in preventing weeds coming through, insulate the plants during winter and improve moisture retention in the summer. Click on the icon for further details. This combination of rootzone sand and peat is a perfect sand mix for roots of turf to grow in. Unlike some builders sand it does not create a hard pan that prevents drainage. Rootzone sand and peat mix is similar to what is used in golf course construction and maintenance and is a well proven growth medium for lawnturf. Click on the icon for further details. This is the natural way to put life back into poor performing soil. This mature peat free mixture has been finely screened to create a friable product rich in nutrients and organic matter. Summerhill Lawns soil conditioner has an excellent appearance which also makes it ideal for use as a mulch. Click on the icon for further details. By using Summerhill Lawns specially formulated pre turfing or pre seeding fertiliser it will ensure your lawn gets off to the perfect start. Our unique blend of mini granular fertiliser feeds your newly seeded or turfed lawn from the roots up. Click on the icon for further details. 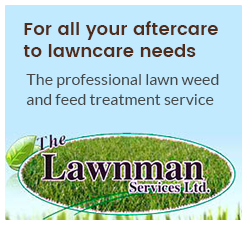 Summerhill Lawns operate a delivery service throughout Ireland. All orders are delivered within 24 hours (if ordered before 1pm) or your day of choice Monday – Friday. Our transport vehicles are fitted with mounty off loading forklifts which allows turf to be placed where you need it. Some small deliveries are made via jeep and trailer. If we get a contractor to deliver your order, it will be unloaded on pallets by a lorry with a tail lift and pallet truck to offload onto a smooth, solid, level surface which is usually on the kerb or on the carpark. Every Year we display our products for judging in connection with the relevant competing Designers and Landscapers at different Garden Festivals throughout the country. Products from Summerhill Lawns feature in many gold medal winning gardens at these Garden Festivals. Click here for some sample pictures. Lawnturf from Summerhill Lawns is Irelands biggest selling and most frequently specified, being the first choice for both professional groundsmen landscapers and experienced gardeners who demand the best. At Summerhill Lawns, we understand that Golf Course Superintendent’s require a consistent supply of quality turf and service from us as turf producers. Economy of scale combined with continuous reinvestment in specialist turf machinery, and technology has allowed us a low cost base to deliver real value, unrivalled quality and performance.